IOGEAR's Bluetooth 4.0 USB adapter is no bigger than a thumbnail, but it offers all the latest Bluetooth technology. Connect your computer to all Bluetooth devices such as cell phones, PDAs, mice, keyboards and more. 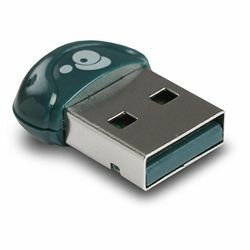 Because of its small size, it can easily be plugged into your computer without blocking surrounding USB ports. Plus, its lower power consumption results in longer battery life on your notebook computer and other devices. Includes software on MiniCD. Requires Microsoft Windows XP+ or Mac OS v10.3.9+.